Summary: Skycastle, the Demon, and Me is the first in a series of middle grade books for fearless, adventure loving kids. WARNING…this book contains a scowling demon, bad decisions, a skeleton key, not foul but hellish language, an ordinary boy and an extraordinary castle. You’ve been warned. Skycastle, the Demon, and Me: An unlikely friendship, a hellish adventure and cliffhangers aplenty to make reluctant readers turn the pages. Andy Mulberry loves to write stories filled with strange adventures, odd characters and mysterious circumstances. To say she was born holding a book in her hand reading would be a gross hyperbole. She lives in Southern California with her scowling teenager, a chubby blue cat-beast, an imaginary dog and one leaky roof. Terms and Conditions: NO PURCHASE NECESSARY TO ENTER OR WIN. VOID WHERE PROHIBITED BY LAW. A winner will be randomly drawn through the Rafflecopter widget and will be contacted by email within 48 hours after the giveaway ends. The winner will then have 72 hours to respond. If the winner does not respond within 72 hours, a new draw will take place for a new winner. Odds of winning will vary depending on the number of eligible entries received. This contest is in no way sponsored, endorsed or administered by, or associated with Facebook. This giveaway is sponsored by the author, Andy Mulberry and is hosted and managed by Renee from Mother Daughter Book Reviews. If you have any additional questions – feel free to send and email to Renee(at)MotherDaughterBookReviews(dot)com. In a future where Earth has been wiped clean of all life, and humanity has moved on to other worlds, twelve-year-old Noah Zarc and his family have embarked on a quest, in a time-traveling spaceship called the ARC, to retrieve two of every animal and repopulate a dead world. Terms and Conditions: NO PURCHASE NECESSARY TO ENTER OR WIN. VOID WHERE PROHIBITED BY LAW. A winner will be randomly drawn through the Rafflecopter widget and will be contacted by email within 48 hours after the giveaway ends. The winner will then have 72 hours to respond. If the winner does not respond within 72 hours, a new draw will take place for a new winner. Odds of winning will vary depending on the number of eligible entries received. This contest is in no way sponsored, endorsed or administered by, or associated with Facebook. This giveaway is sponsored by the author, D. Robert Pease and is hosted and managed by Renee from Mother Daughter Book Reviews. If you have any additional questions – feel free to send and email to Renee(at)MotherDaughterBookReviews(dot)com. Charlotte did visit the London Book Fair last week and met her author friend, David Chuka, who wrote a great article about the event. There’s also a short video of Hugh Howey’s interview, the author of Wool. The article is a goldmine for Indie Authors. Enjoy! Zeppi. Click on the picture to read David Chuka’s article! Indie Bestsellers Hugh Howey, Barbara Freethy, Bella Andre, Stephanie Bond, Liliana Hart, Candice Hern, and Jasinda Wilder. 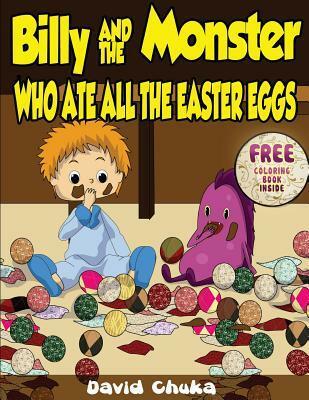 Today, I’d like to share with you the chance to win a signed copy of the Amazon Best-seller ‘Billy and the Monster who Ate All the Easter Eggs’ by British Author David Chuka who is a friend of mine. With Easter around the corner, this book will be a welcome addition to your loved ones library. This is the third book in the Billy and Monster series and it has gotten about 48 glowing reviews on the Amazon website. Before I reveal how you can enter to win a signed copy, let’s find out what happens with Billy and Monster in this Easter edition. Billy and Monster love all the holidays as they get to spend quality time together. However, their best holiday is Easter as they get to eat their favorite food…CHOCOLATE! This year, they’re spending Easter with Grandma Chocalicious who loves Chocolate even more than Billy. She’s an expert at making chocolate cake, chocolate waffles and even chocolate pasta. This year Grandma Chocalicious has made a pyramid of Easter eggs for her party on Easter Sunday. Billy and Monster want one of the Easter eggs but Grandma says they have to wait till Easter Sunday. What happens when Billy and Monster tip toe downstairs and the pyramid of Easter eggs comes falling down? For a chance to find out what happens simply click the link below and you could very well have your signed copy just in time for Easter. Giveaway ends April 15, 2014. Winking Day is now available! In all Amazon stores and at a special launch price. Check out Zeppi’s 10th adventure and have fun! Zeppi is having a hard time tidying up inside his teepee. On top of this, his friend Alesdor and his parents, and even Lilit his squirrel friend are winking at each other and Zeppi feels left out. The Adventures of Zeppi #10: available soon!